Salem College senior Cassandra Hardy was honored with the 2013 Elisabeth Oesterlein Award at Salem's Founders Day Convocation. The Oesterlein Award is named in honor of Salem’s first teacher. Candidates are nominated by members of the Salem community – faculty, staff and fellow students – and each nominee must compete against other truly outstanding seniors. The winner must have attended Salem all four years of college; made a notable contribution to the quality of life at Salem and exemplified quality leadership; and been conscientious and diligent in the pursuit of academic excellence, attaining at least a 3.0 average overall. 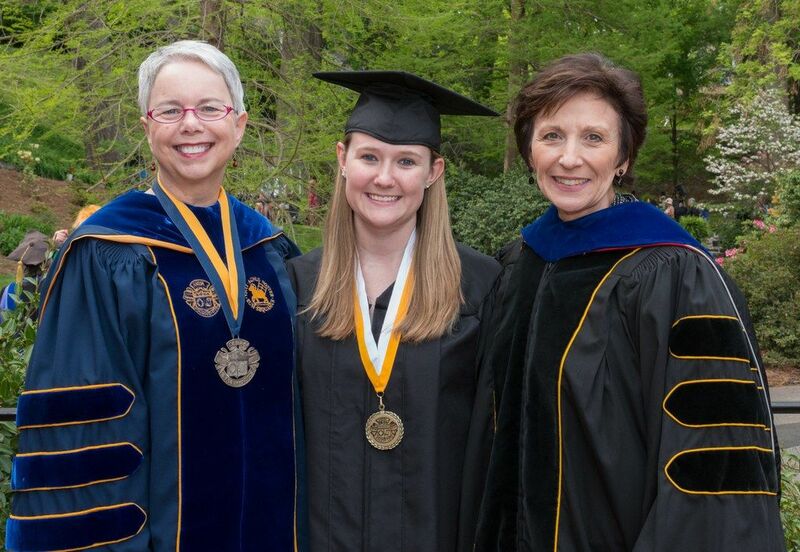 Hardy came to Salem as the recipient of the Edith Willingham Womble Full Merit Scholarship. A biology major with minors in chemistry and business administration, she earned membership in the Honors Program, the Lehman Scholars Program, Alpha Epsilon Delta—the pre-health honor society—and Beta Beta Beta—the biology honor society. Last summer, she was one of only 12 students nationwide chosen to participate in the Summer Neuroscience Experience program at The University of Cincinnati College of Medicine, and after her January Term 2013 internship with the Wake Forest School of Medicine’s Department of Immunology, she was asked to stay on in a part-time position after her internship concluded. Hardy served as co-president of the Alpha Lambda Delta first-year honor society, Orientation Leader, Junior Marshal, Sights and Insights yearbook editor-in-chief, Honor Guide and vice president of the Student Government Association. She represented Salem at the Twin Cities Leadership Conference as a sophomore, served as a member of the Committee on Community and was honored as a leader and scholar with induction into the Mortar Board honor society. Off campus, Hardy gives back to the community, volunteering her time at Wake Forest Baptist Medical Center and The Children’s Home. After taking a year off to travel, she plans to pursue a degree in medicine.